Professor Dessel specializes in the history and archaeology of the eastern Mediterranean and the ancient Near East. His research focuses on the rise of social complexity, urban-rural dynamics in the Bronze and Iron Ages, and ethnicity in the ancient world. 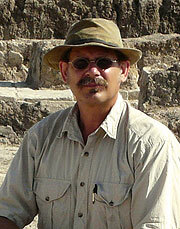 He has participated in excavations in Israel, Turkey, Egypt and North America. He has directed the excavation of two village sites, Tell el-Wawiyat and Tell ‘Ein Zippori, in the Lower Galilee of Israel. Currently, is the co-filed director at the site of Tell Tayinat in Turkey. He recent book, Lahav I. Pottery and Politics The Halif Terrace Site 101 and Egypt in the Fourth Millennium B.C.E. is a study of the Early Bronze Age I ceramic material from the Halif Terrace in Israel. He has also published on Chalcolithic chronology, Chalcolithic cult, the problem of publication in Near Eastern archaeology. He is currently working on vernacular architectural traditions of the Iron Age Levant. In addition to the World History survey, Professor Dessel teaches a two-semester sequence on Jewish History. He also teaches a variety of topics courses in Jewish and ancient Near Eastern History including “The History and Archaeology of Ancient Israel,” “Ancient Synagogues of the Roman and Byzantine Periods,” “History and Archaeology of Mesopotamia,” “Ancient Egypt” and “Ethnicity in the Ancient Near East.” Professor Dessel is a member of the Fern and Manfred Steinfeld Program in Judaic Studies. He is also serves as the treasurer and a member of the Board of Trustees of the Albright Institute of Archaeological Research in Jerusalem. "Tell Tayinat, Turkey: The Origins and Organization of Small-Scale States in the Iron Age Levant” The Ancient Near East in the 12th-10TH Centuries BCE: Culture and History. University of Haifa, May 2010.